In the late '70s and early '80s, the line between Pure Pop bands and New Wave outfits became intertwined. Most bands that played slick, melodic Beatles-influenced pop were considered Power Pop in the mid '70s but by the time bands like Squeeze, The Sinceros, 20/20, Nick Lowe, The Plimsouls and other like minded acts hit the music scene, they were quickly branded New Wave and marketed as such. This was not necessarily a bad thing in terms of commercial sales, but we all know that when a music scene dies, it takes most of the bands with it. Some bands (Squeeze, Nick Lowe) were able to rise above but when New Wave became old news, then the bands lost label support and any momentum they had built up. 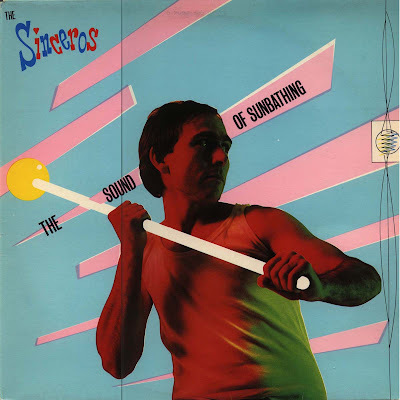 The Sinceros were an excellent Pop band consisting of four great musicians: Mark Kjeldsen (vocals/guitar), Ron Francois (bass/vocals), Don Snow (keyboards/vocals) and Bobby Irwin (drums). While Kjeldsen was the main frontman and wrote the majority of the songs, both Snow and Francois offered some tasty treats to The Sinceros' repertoire. On The Sound Of Sunbathing, the band's 1979 debut, was a hook-filled Power Pop party dressed up in dayglo colors... with a little New Wave spice thrown in for good measure. Like Squeeze, The Sinceros' songs were instantly catchy and those lucky enough to hear them would have their melodies stuck in their heads for days, weeks, months and, for us lucky ones, decades! The album is chock full of great tunes including Kjeldsen's "Little White Lie", "Quick Quick Slow" and "So They Know", Snow's "Hanging On Too Long" and Francois' "Good Luck (To You)", but two songs received the most attention: "World's Apart" and "Take Me To Your Leader". Unfortunately, these two tracks were, at best, average Pop tunes dressed up in quirky New Wave arrangements, which possibly made them more appealing to the masses. Thankfully, the rest of the album is loads better, so anyone suckered in by those two tracks were more than pleasantly surprised by the high quality of the rest of the material. Now, don't get me wrong, those are fine tracks, but compared to the rest of the album, they sound like b-sides! For music fans not familiar with this great debut, the best way to describe it would be a cross between Squeeze's Cool For Cats and Argy Bargy: not quite as Pub-like as ...Cats, but not quite as accomplished as Argy. While there's not really a bad song on the album, The Sinceros were still in the process of becoming a GREAT band, something they achieved on Pet Rock, their sophomore album (which I'm hoping is reissued soon!). After that, the band split and the members went their separate ways: Snow ended up in Squeeze (ironically enough) for their Sweets From A Stranger album; Francois joined The Teardrop Explodes and Irwin played drums for Nick Lowe for years and years. Kjeldsen unfortunately passed away in the '90s. Cherry Red's excellent reissue of The Sound Of Sunbathing retains the UK album cover and track listing and adds three non-album bonus tracks, making this an absolutely essential purchase for any Power Pop, New Wave and '80s music fan. I can only think of ONE reason why The Sinceros may not have clicked with the youth of the '80s: Kjeldsen's moustache! When New Wave was considered the music of the young generation, anyone with a mustache was considered uncool (including The Stranglers' Dave Greenfield!). Fortunately, Kjeldsen had a full, slightly more fashionable beard by the time of their sophomore album, but it may have been too late! The moustache did them in! Well, I'm not entirely serious... but kinda. I actually love this band in general, but I have to say "Pet Rock" was HEAPS better than Sunbathing. That is one of my favorite albums of all time. I chuckled at your comment about Mark's 'stache. You could be on to something! Not much there now, but there will be! Oh, and Pet Rock is mega heaps better!